This carnival game is one that everyone can play. The battery powered pigs race off when you lift the gate, starting and stopping at their own pace so you never know who the winner is until their snout hits the finish.the game is 30x32 and folds up flatish and weighs 25 lbs. 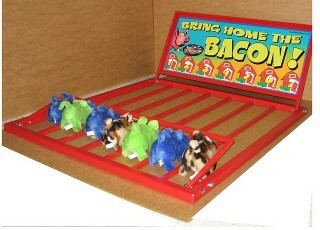 It comes with 12 assorted pigs.